How do you like to organize what you have to do? Do you keep a list or multiple lists? In an organizer, on a piece of paper, on your phone? I like to keep lists. I have a system that has served me well at work. I have a spiral-bound weekly organizer. In the morning I write down what I need to do on the left side of the page and throughout the day or at the end of the day I write down what I’ve accomplished. If there is anything I didn’t get to or something new that I know I will have to do, I write it on the left side for the next day. This was something I started doing a few years ago because it helped me keep track of what I accomplished when I had to write quarterly reports of my achievements for my boss. It also made me feel better to see what I had accomplished each day when I felt like I had been running around and not getting anything done. I never thought to do this in my personal life, but recently on the Happier Podcast, they discussed Ta-Da Lists, which is what I was doing all along but didn’t have a snappy title for. One of the benefits is if you’re not accomplishing what you want to be doing- like in my case writing more- I can see what I was actually doing and in some cases, I’m doing things that are pretty important. For example, in the past week, I have been getting reorganized after evacuating for hurricane Irma. So I started doing personal Ta-Da lists a few days ago and so far it has been motivating to me to write (almost) daily so I can add it to my list before I got to bed that I accomplished writing. 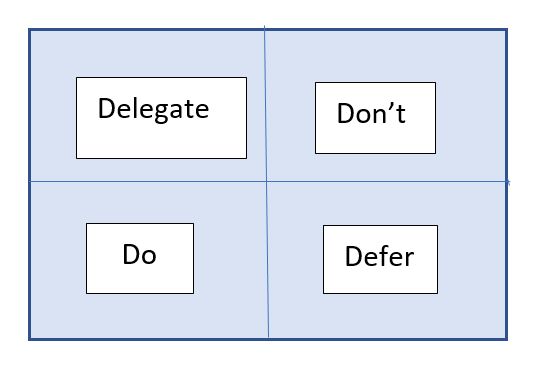 Below you will see an example a senior director at work gave when I asked how he organizes what he has to do. I was curious how someone at a senior level organized himself. He didn’t give me a method as much as a decision-making tool which also important to consider. Is what I’m doing the most important thing from the list? Can someone else do it for me? Is it important that it is done today? If not, it can be deferred so something more pressing is taken care of sooner. I would love to know your methods so please share.